Thieves ripped an ATM out of a bank wall as they stolen nearly £90,000 in a village ram raid. Police said a stolen JCB hauled the machine out of the wall of Barclays Bank in High Street, Henfield, in the early hours of Sunday morning (April 15). The cash machine - which contained £88,000 - was found in a burnt-out Nissan Navara 4x4 pick-up truck in Dunsfold later that morning and police are still hunting for suspects. Officers said the yellow JCB pulled the machine from the wall at about 2am. It was then put in the back of the pick-up before thieves made off, leaving the digger in the middle of the street. The JCB was stolen from Edburton around an hour earlier and officers said the crooks stopped for around 20 minutes to remove the bucket from the vehicle in Bramlands Lane, Henfield, at 1.25am. Both the ATM and pick-up were found burnt-out in Oakendon Woods just after 2.45am. Police said at about 4am the suspects rammed their grey Audi A6 estate car into another vehicle being driven by a member of the public who confronted them. At least three suspects are believed to be involved and it is thought one made-off from the bank on foot, with the others in the Navara. 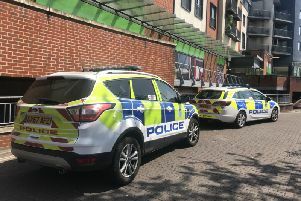 Officers said a 25-year-old man, from Henfield, has been arrested on suspicion of burglary and released under investigation. Anyone with any information is asked to report the details online or phone 101, quoting serial 157 of 15/04.